How to promote your business if you are not confident about your services and the products you offer? The best way is to use sponsored posts on Facebook. I am not saying that all those who use sponsored posts lack confidence. But all those who lack confidence definitely use sponsored posts to promote themselves. Use a good looking girl's image in the design. 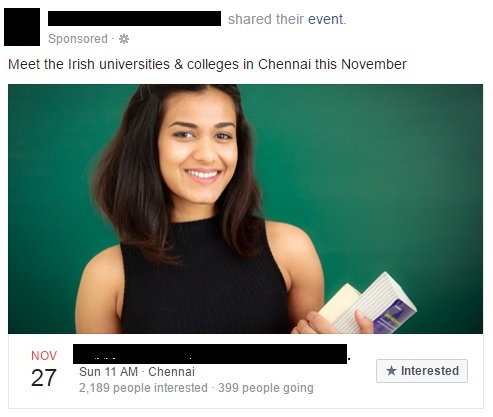 In the above advertisement where an enterprise is trying to sell "studying abroad", they have used a good looking girl's picture. When this image lands in a guy's notification on FB, chances are that he may click the interested button without even reading what the content is all about. By doing these two things, the Facebook page will invariably garner more likes and the particular campaign will also receive many leads. The marketing team of that particular enterprise will have good metrics to project to their board. The management will be happy; but at the end of the day, business profits will be still low. IIPM tried a different variation of this technique and fell face down after some time. This is going to be the same case with all the FB pages that add likes in an inorganic manner.